I knew it was in the offing, but nothing was arranged and I still didn’t know if or when I would be going. Last night, with one hell of a whoosh, a bang and a clatter, that all changed and off I go on February 14th (alert to Cockrobbinn – Valentine’s Day – Alert, Alert !!!) to the Bluegrass State of Kentucky, USA. 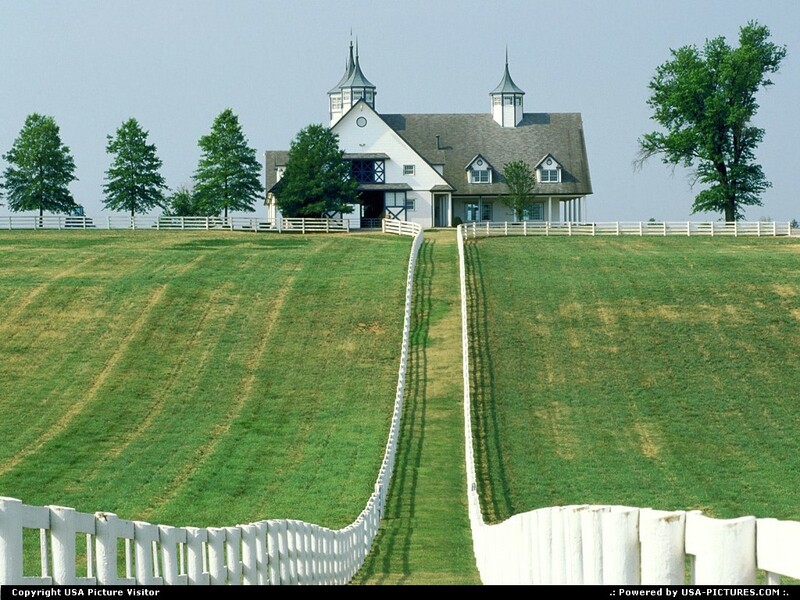 If anyone can remember the film Seabiscuit; about an American horse racing legend – it was filmed at Keeneland which is close to where I will be visiting although I won’t be going to the races on this trip. Not a holiday as such as I am going out there to help look after my grandkids because my daughter-in-law is having a medical procedure and will be incapacitated for a while. I will be jetting off across the Big Pond whilst Cockrobbinn stays at home to look after our trio of beautiful cats, and the house of course – well, at least I hope he does. There will be plenty of check-lists and to-do-lists posted about and woe-betide him if he doesn’t tick them off each day. I bought a lovely huge new upright freezer just after Christmas and it is already filled with delicious homemade meals and snacks; one thing Cockrobbinn is not good at is cooking but he does love his food so he won’t go hungry. Before I had even applied for my ESTA, I was checking out the Geocaching map around Lexington and whoopee, there are at least nine within easy walking distance of my son’s house (I won’t be driving out there as they drive on the wrong side of the road!!) and I can’t expect my son to ferry me around as he will be working. I say easy walking distance, but I mean definitely possible considering everything seems bigger in the USA and the roads longer! Cockrobbinn and I visited some years back during February and the weather was beautiful with lovely blue skies but it was -12° and the Americans looked very strangely at us as we walked around the deserted roads; I’m sure they were thinking what on earth were these strange British people doing – actually walking somewhere. One car even slowed down to ask if we were ok! I am most certainly going to introduce my grand-children to Geocaching; at eight (nine by the time I arrive), six and three (hope to goodness I’ve got the ages right!!) they are the perfect age to learn. Little one might be a bit young but she can tag along with her brother and big sister. Only last Saturday we took my grand-daughter, who lives close by, out to find the final cache in a Multi-cache series; didn’t find it but that is another story. Just before we left the house she decided that as I was Robbinn, granddad was Cockrobbinn, she should have a name too. At five years old I was informed that she was definitely not going to be called Baby Robbinn which I had inadvertently suggested, then she came up with the name Honey Robbinn (at the time I was desperately trying to keep her beautiful long hair tied back as she was eating her breakfast porridge with ‘honey’). Good name or what? So, my three American grand-kids – what shall I call you? I suppose it could be Big Robbinn, Middle Robbinn and Small Robbinn but I think they might have something to say about that. Big one might like to be called Chelsea Robbinn (for some unknown reason he supports Chelsea FC); middle one could be Frozen Robbinn (I think we all know about that film!) but not sure about Baby Robbinn. Perhaps I had better wait until I get out there or I might be in trouble. Quite a nest of Robbinns! With just over two weeks before I go, preparations are in hand and I’ve ordered a Travel Bod after seeing quite a few acquaintances comment about them on Twitter. I thought it would be handy to carry one with me ‘just in case’ I run out of power. Looks like it will be handy to charge my iPad as well. 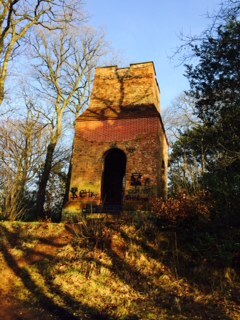 Back to my very first Multi-cache – last Thursday was the most beautiful spring-like day in Camberley; Cockrobbinn was working and I decided it was time to attempt a very local multi-cache which I had been looking at for ages. Max Booty: Camberley Now and Then was within walking distance of my home so off I set armed with paper and pen to write down the numbers I needed for the final co-ordinates (I had to visit eight different sites in Camberley to locate the correct numbers to make up the co-ordinates of the final cache). 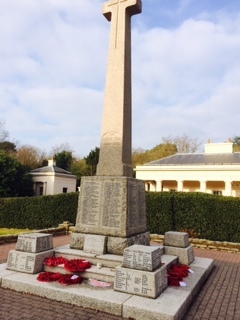 The cache was described as a pleasant stroll around Camberley, taking in a couple of parks and absorbing a little bit of the local history, culminating in a visit to the ancient and mysterious Obelisk. I have lived in Camberley for nearly thirteen years and have never heard of an Obelisk so I was quite intrigued. My first stop was outside the London Road Playing Fields which were the former home of Camberley Town Football Club; first clue easily found as I had to find out what time the playing fields opened. Onto my next clue which was at St. Tarcisius Church, London Road. 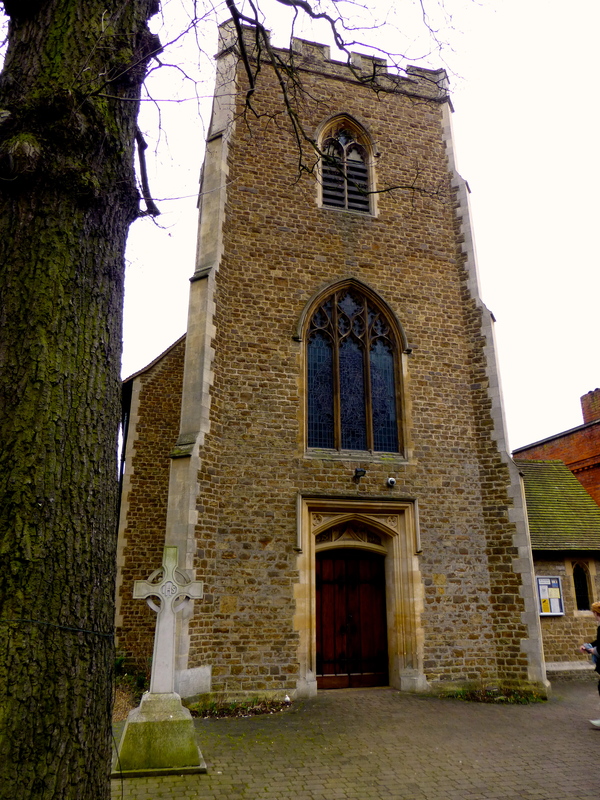 This church was built on land left by Lady Southwell, as a memorial of the Supreme Sacrifice made during World War I by British Officers, many of whom received their training at the Staff College and at the RMC Sandhurst which is opposite. Designed by Mr. F.A. Walters, architect of Great Ormond Street, London the build is ‘Perpendicular Gothic’ with a tower 50 feet high. Internal length of 96 feet; stone Bargate/Godalming; reredos: Beer Stone from South Devon. It cost £13,500. There is a stone in the wall by the entrance, with a Latin Inscription and I had to count the letters of the first line of the inscription. Easy peasy – I was doing well. I was very close to the next clue which was just across the main London Road at the War Memorial situated in front of the Sandhurst Royal Military Academy. The main memorial is to the Great War, though supplementary stones also remember the dead of WW2. I had never stopped here before and it was quite a peaceful little spot although on the main A30. I had to discover how many people with the surname of Goddard had been remembered on the memorial. Back over the main road and onto the relief road bought me to the next clue which was on a BT box in-between two shops, then onto the High Street where an old church, St. George’s had been knocked down many years previously. I was doing well and enjoying the lovely sunshine. I back-tracked a little here to find a pub in the middle of Camberley with a biblical reference on its sign. I had been to Camberley Library before, and I knew that Surrey Heath Museum was next door, but little did I know that if you walk between the two, you come into a reasonably new park with an adventure playground. 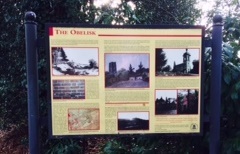 At the beginning of the park there is a sign which gives a potted history of the Obelisk which is the final destination. Nobody knows for sure why the Obelisk was built, but there is a mention of the Hellfire Club which I rather like. A further clue I needed was found on the sign. Now for the intriguing part – The Obelisk. I never knew it existed and the beauty of Geocaching is that you find all these treasures. It was a lovely walk up the hill to the top and I didn’t see a single person; it was so quiet although I could hear the drone of cars along the A30 in the distance. 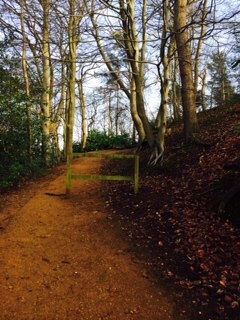 A little woodland path twisted and turned until eventually it reached the top where, thankfully, a seat was nicely positioned for an amazing view over Camberley. One of the first things you notice about the Obelisk is all the signatures that have been carved into it over the years. Some of them date back well over 100 years. My final clue was to find a certain name and date. I have to admit it took me quite a while to find as it was very high up, but eventually I found the right one and then enjoyed a well-earned rest admiring the view, pleased that I had found all eight clues. I had already decided that we would bring our little grand-daughter here to find the main ‘booty’ on Saturday morning. Saturday dawned bright but really cold so we wrapped up well and set off with “Honey Robbinn” making up the third member of our team. Two hours later we gave up as we had searched behind every pine tree which stood next to a rhododendron bush (the hint); I haven’t yet told Cockrobbinn that I believe I put the wrong co-ordinates into his Garmin and my iPhone !!!! Honey Robbinn enjoyed a play in the adventure playground with Cockrobbinn looking on whilst I scoured even further afield. Nevermind, there is always next Saturday and this time I will have the correct co-ordinates and perhaps a bit more luck. This entry was posted in Caching, Camberley, Geocaching, Kentucky, Multi-cache and tagged Booty, Geocaching, Kentucky, Multi-cache, USA. Bookmark the permalink. 1 Response to KENTUCKY here I come ……. How exciting, a trip across the pond! I look forward to hearing all about that.